Before choosing a siding for your home, let us help you choose your siding color. When it’s time to choose a new color for your siding, you will undoubtedly sort through countless options that you love (and countless options that you, well, less than love). Choosing the siding color for your Leesburg home doesn’t just affect how you feel about your home, but it also directly affects its value. How can you pick the right color that ensures you’ll end up with a stylish exterior and an increase in home value you’ll love? Follow these simple tips! Look around and see what your neighbors use for their siding colors. Which homes really pop? Which homes are you happy aren’t yours? Pay special attention to homes that are styled similarly to yours. While picking a color you like is important, it’s equally important to pick a color that will blend in well with your surrounding neighborhood. How big is your house? Siding color swatches can be deceptive when viewed in small squares or tiny patches. A beautiful dark siding color may look rich on the 2-inch square swatch, but on a large size house it can look overwhelming and macabre. The same is true for colors on the opposite end of the spectrum. Colors that are too light may make smaller homes blend right in (in a bad way). Lighter colors can neutralize less attractive features, while darker colors can highlight more attractive features. 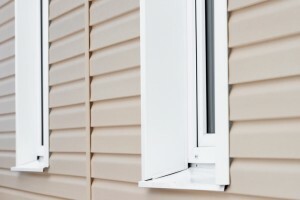 Siding colors will inevitably change over time, as you choose to change materials or have to upgrade out of necessity. Your roof is less changeable, as most last from 20-30 years. The color of your roof should be considered when you choose a color for your siding. Dark roof? Consider a lighter siding color. Is your roof more neutral? You have more options, but still pay attention to how your desired colors work with what will be above them and your desired siding material. What does your existing landscaping look like? What type of landscaping are you planning? If your yard is going to be minimal and contemporary and your siding color is typically seen in a candy store, they may not match up too well. Your landscaping can change over time, so don’t let what is there now deter you if you are planning on switching it up in the near future. If you are ready to get the perfect new siding color (and siding) for your Leesburg home, you can trust Absolute Home Solutions. We are a family owned business with top-notch customer service. We will never cut corners and we will work tirelessly to make sure that you love your home. Contact us online or give us a call at 240-328-9872 for more information and a consultation. We serve many areas throughout Montgomery County, Anne Arundel County, Howard County, Baltimore County, Washington, D.C., and Virginia. To see examples of our work and get exclusive specials, follow us on Facebook, Google+, Pinterest, Twitter, YouTube, and Houzz. This entry was posted on Friday, July 8th, 2016	at 2:57 pm	and is filed under Siding . You can follow any responses to this entry through the RSS 2.0 feed. You can leave a response, or trackback from your own site.